Rafael Viñoly Beceiro (born 1944) is a Uruguayan architect. He is the principal of Rafael Viñoly Architects, which he founded in 1983 and has offices in New York City, Palo Alto, London, Manchester, Abu Dhabi and Buenos Aires. This name uses Spanish naming customs: the first or paternal family name is Viñoly and the second or maternal family name is Beceiro. In 1964, he formed the "Estudio de Arquitectura Manteola-Petchersky-Sánchez Gómez-Santos-Solsona-Viñoly" architectural firm with six associates. This practice would eventually become one of the largest architectural practices in South America, completing many significant commissions in a very short time. In 1978, Viñoly and his family relocated to the United States. For a brief period he served as a guest lecturer at the Harvard Graduate School of Design, settling permanently in New York City in 1979. He founded the firm Rafael Viñoly Architects PC in 1983. His first major project in New York was the John Jay College of Criminal Justice, which was completed in 1988. 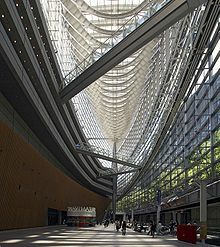 In 1989, he won an international competition to design the Tokyo International Forum, which was completed in 1996. His firm's design was one of the finalists in the World Trade Center design competition. Viñoly is a Fellow of the American Institute of Architects, an International Fellow of the Royal Institute of British Architects, and a member of the Japan Institute of Architects as well as the Sociedad Central de Arquitectos. Major works by Viñoly include 432 Park Avenue, 20 Fenchurch Street and the Curve Theatre. The building 20 Fenchurch Street in London won the 2015 Carbuncle Cup for its ugliness. Two of the skyscrapers designed by Viñoly, the Vdara in Las Vegas and 20 Fenchurch Street in London, have experienced unusual sun reflectivity problems due to their concave curved glass exteriors acting as respectively cylindrical and spherical reflectors for sunlight. In 2010, the Las Vegas Review Journal reported that sunlight reflected off the Vdara's south-facing tower could make swimmers in the hotel pool uncomfortably warm, as well as melting plastic cups and shopping bags; employees of the hotel referred to the phenomenon as the "Vdara death ray". In London during the summer of 2013, sunlight reflecting off 20 Fenchurch Street melted parts on a parked automobile as well as scorching the carpet of a nearby barber shop. ^ Gitschier, J. (2011). "The Connection between Space and Thinking: An Interview with Rafael Viñoly". PLoS Genetics. 7 (12): e1002445. doi:10.1371/journal.pgen.1002445. PMC 3248556. PMID 22242010. ^ "Rafael Vinoly Architects Locations". Vinoly Architects. Retrieved 2015-07-03. ^ "Works". Retrieved May 8, 2015. ^ Raphael Vinoly Architects. "Life getting hot for architect Rafael Vinoly". Retrieved May 8, 2015. ^ e-architect (January 8, 2015). "Rafael Vinoly Architect : Practice Information". Retrieved May 8, 2015. ^ "Vdara visitor: 'Death ray' scorched hair". Wikimedia Commons has media related to Rafael Viñoly. "Rafael Viñoly collected news and commentary". The New York Times.